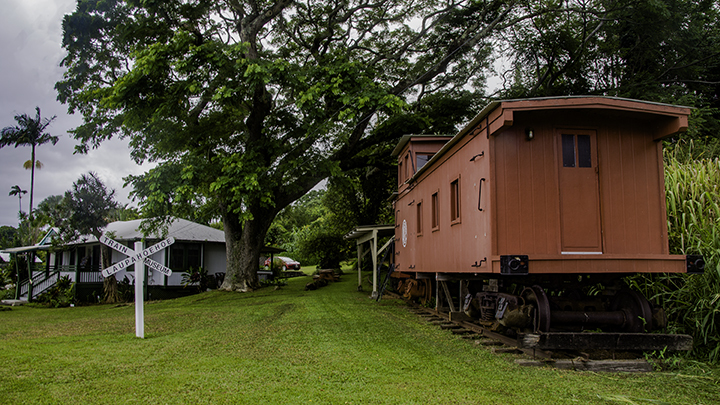 The Lapahoehoe Train Museum where you can learn about Hawaii’s railroad history. Honolulu is constructing a new, and what some consider controversial, metro rail system. It’s goal is to help address one of the worst traffic conditions in the entire US. But few people know about Hawaii’s railroad history and the role it played in developing the local economy. Currently, Hawaii has no commercial freight or true passenger rail services. But it still has a few short lines that successfully cater to the tourist market. Honolulu inexorably marches on to complete a new metro rail system that has taken over 40 years to build. So it’s worthwhile to contrast this latest transportation infrastructure development with past generations of railroads systems in Hawaii. The islands of Oahu, Kauai, Maui and the Big Island, all had railroad operations mostly to support the sugar plantations. Sugar was, at one time, Hawaii’s largest and most significant industry. Up to the 1950s, railroads played a critical role in transporting sugar cane from the fields to sugar mills. During this time, Hawaii had numerous railroad companies because they could haul sugar cane more efficiently than through roads. A number of them were also used to haul other forms of freight. Some also provided economical transportation for local and visiting passengers. Hawaii’s first railroad began on Kauai in 1881 to haul sugar cane to Kilauea Plantation. By 1915, Kauai had over 200 miles of track. But by the 1950s, plantations stopped using them as using trucks became more cost-effective. Today, all that is left of Kauai’s railroads is the 2.5-mile Kauai Plantation Railway. It operates as a part of a plantation tour package. Oahu’s railroad history dates back to 1889 when the Oahu Railway & Land (OR&L) company started operations. It hauled sugar cane and later carried freight and passengers. It eventually became Hawaii’s largest railroad. The company’s tracks extended from Honolulu all the way to Kahuku. It also included an 11-mile branch to Wahiawa to service nearby pineapple fields. During World War II, the military heavily used the railroad to transport material and troops. Traffic dramatically declined after the war as plantations increased their use of roads to transport cane. But the final blow to the OR&L was when a huge tsunami wave damaged its tracks along the North Shore in April 1946. This forced the railroad to shut down. After that, the US Navy acquired 11 miles of OR&L tracks to transport ammunition between Pearl Harbor and its Lualualei Naval Ammunition Depot. The Navy ceased rail operations in 1974 and transferred ownership of the tracks to the State of Hawaii. But after several years of restoration, the Hawaiian Railway Society began using these tracks. It operated weekend train service in 1990 as a historic attraction. The Big Island of Hawaii’s railroad history began with the Hilo Railroad in 1899. It continued to grow with a 33.5-mile line along the hilly and breathtaking Hamakua coast. This extension was extremely expensive because the company had to construct numerous tunnels and bridges. This ultimately forced the railroad into bankruptcy in 1914. It re-emerged as the Hawaii Consolidated Railway. And it continued moving sugar cane, freight and passengers through World War II. Its Hamakua coast tracks became especially popular with tourists because of the scenic views they afforded along the way. As was the case with the OR&L, the same 1946 tsunami destroyed significant amounts of tracks. This ultimately forced the railroad to shut down. Maui’s railroad history began in 1890 when the Pioneer Mill constructed a short line to haul sugar cane from its plantation fields. As was the case on all islands, the railroad stopped operating in 1950 when hauling sugar cane by trucks became more cost effective than railroads. However, railroads did not totally disappear on Maui. In 1969 the Lahaina, Ka’anapali and Pacific Railroad began operating a popular steam locomotive. People lovingly called it the Sugar Cane Train. It runs over six miles of track as a tourist attraction in the resort town of Ka’anapali. So as Honolulu tries to complete its new metro rail system by 2025, one wonders about its future legacy. It starts a new chapter in Hawaii’s railroad history. It’s somewhat ironic that a new rail system would be displacing some elements of a road system. This because roads, in the past, rendered railroads in Hawaii obsolete. Will this new rail system be looked upon by future generations with the same sort of nostalgia associated with railroads that once served Hawaii’s plantations? Only time will tell.